The lights go down, 20,000 emo-lite teens scream. On the stage there are 3 skyscrapers. In unison, lights start flickering. As each skyscraper window is brightly lit, the lights turn into carbon copies of men walking up stairs to the top of the buildings. These men reach the top as one by one they slowly fall to their end and knock the others down like dominoes. As this happens the walls of the skyscrapers rise, showing the band as the prog-rock demigods they are. Muse is nothing if not indulgent. And that's not a bad thing. I must qualify this review by saying that I'm a huge fan of Muse. I was there, on the floor soaking every second up. 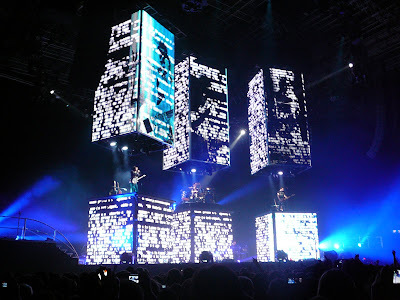 You think that after 4 Muse concerts in the last 4 years would turn a guy off. I previously reviewed their latest cd "The Resistance ." You can find it through using the keyword "muse." 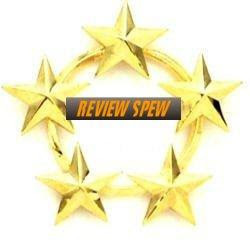 (who doesn't want to read a 7 month old cd review?) In short I think the cd is amazing. I would almost say near perfect. The only song I skip is track 5. Thankfully they did not play track 5 at the show. In this review I plan to comment both on the actual show and my viewing experience. So I always want to stand for concerts in the GA area. The only positive to this is actually being closer to the stage. There are so many negatives to doing this. First off, standing for 3-4 hours is only acceptable if I'm waiting to rent a movie at redbox or trying to get my drivers license renewed. Second, what is up with the cloud of hot breath that floats over the floor at rock concerts? It's like a sauna of large pretzel stink and marijuana smoke. Also, why the h@ll do people have to go past me when they are trying to get closer to the stage? Do they think to themselves "Hey, we're packed like pickled sardines in here, maybe I'll try to scoot past that awkwardly handsome guy there..."
Back to Muse. As expected, they played nearly half of their latest album. I was pleased to hear United States of Eurasia (1984 reference) while video of oppressive and corrupt governments were displayed(i.e. Hitler, the U.N., and even Obama). The show, much like the resistance album, had a huge 1984 feel to it. Cameras and eyes were prominently shown on the screens. Even the giant balloons filled with confetti were giant eyeballs. For anyone who has not read George Orwell's classic book, I highly recommend you do it now. Of course they played the fan favorites: Starlight, Time is Running Out, Knights of Cydonia, and Supermassive Black Hole. I felt the highlights of the concert were their rendition of Feeling Good, New Born, and Unnatural Selection. Though they did transition the songs with heavy riffs, even playing some Hendrix and the Star Spangled Banner. The sound quality at the E Center was surprisingly great for an arena. Their songs sounded cd quality or sometimes better. Suffice it to say, they put on a good show. If I have any gripes with the show it's that they didn't play any songs from their first cd, nor did they play a personal favorite of mine "Butterflies and Hurricanes." Also, it seemed like a shorter show. They did manage to pack a lot of rockin' into this show, but when a concert is over at 10, I am left wanting a little more. They hardly spoke to the audience, but I am all right with that, it was no talk, just rock. All gripes aside, it really was an experience. One of the greatest concerts I've seen! 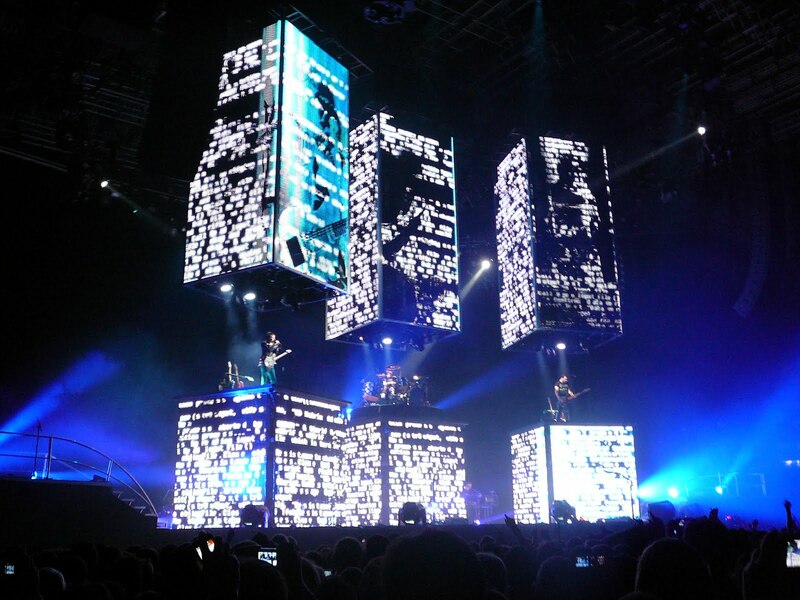 I really feel that even people who don't know Muse well would even enjoy the whole event. Just be ready to spend 40 bones. I hereby give Muse 5 stars for rocking my socks off.